‘Fire and Ice’ tells the story of the evil Nekron who is trying to take over the world using his ice power. The only force still standing against him is that of Firekeep, a castle situated on a volcano. When the princess Teegra of Firekeep is kidnapped, is it up to the lone survivor of a village, Larn and the mysterious Darkwolf to save her and defeat Nekron. So Ralph Bakshi has directed a multitude of animated movies, most notably ‘Fritz the Cat’. His reputation is that of a director who doesn’t feel that animation should talk down to the audience, or necessarily be only aimed at children. 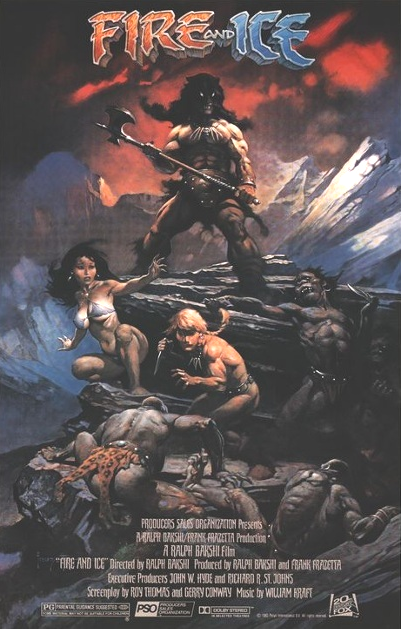 For ‘Fire and Ice’ Bakshi teamed up with Frank Frazetta, a fantasy illustrator, who had previously worked on characters such as Conan. So ‘Fire and Ice’ is aimed at a very specific audience; that of the hard-core fantasy fan. You have your microkini wearing princess, your heavily muscled hero and your evil wizard. All of the tropes of fantasy art are represented here, even the ones that are more troublesome. 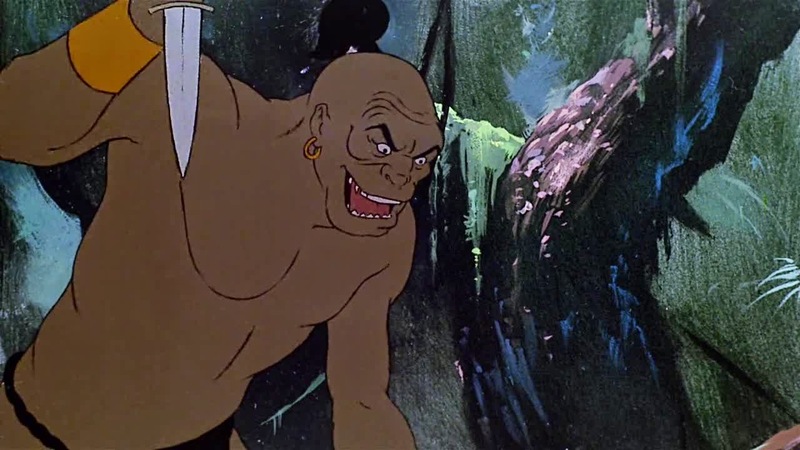 You also have you dark skinned ‘sub-humans’ who throw spears and an evil lesbian witch. I’m not going to criticise the film for having such elements as they are an inherent part of the works it is trying to reproduce. The offensiveness of such concepts, purposeful or non is a separate debate. What I will say is that they further reduce the audience for this film, one that feels very exclusive already. ‘Fire and Ice’ has no interest in entertaining you unless you love it unconditionally on its own terms. I like fantasy films but ‘Fire and Ice’ left me quite cold. It feels surprisingly dry for a film in this genre. 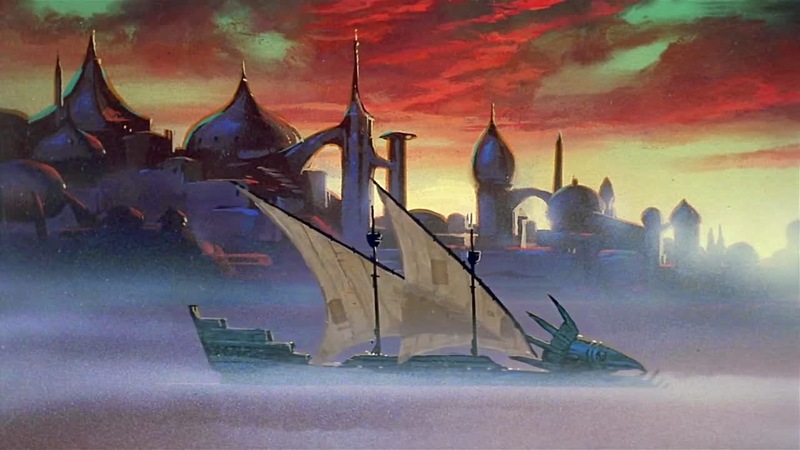 The direction of Ralph Bakshi, although very good, is far too serious for this type of story. It’s not like this type of film needs comedy scenes but it does require a certain self-awareness to the type of material being adapted. Without having a sense of playfulness ‘Fire and Ice’ feels needlessly heavy and somewhat pretentious. The real issue with ‘Fire and Ice’ is the story and its severe pacing issues. The middle section of the film overstays its welcome for considerably too long. The ending feels rushed due to this, despite the film having had more than enough time to tell its relatively simplistic story. ‘Fire and Ice’ lacks urgency, we go from sequence to sequence with no real feeling of progression. It’s as if a series of fantasy illustrations have been selected to create animated sequences and they have been stitched together once completed. I don’t entirely understand why this collaboration happened in the first place. You have an artist who creates stunning singular pieces of artwork and ask him to create hundreds of pieces of art for an animated feature. Obviously the lack of time will make the art suffer when compared to that of the paintings which inspired it. The power of fantasy illustrations is to capture a moment in time with a sense of well detailed hyper reality, something that a tight animation schedule would never allow. If inherent limitations of scheduling mean you can never capture the magic of these paintings, why bother to try? 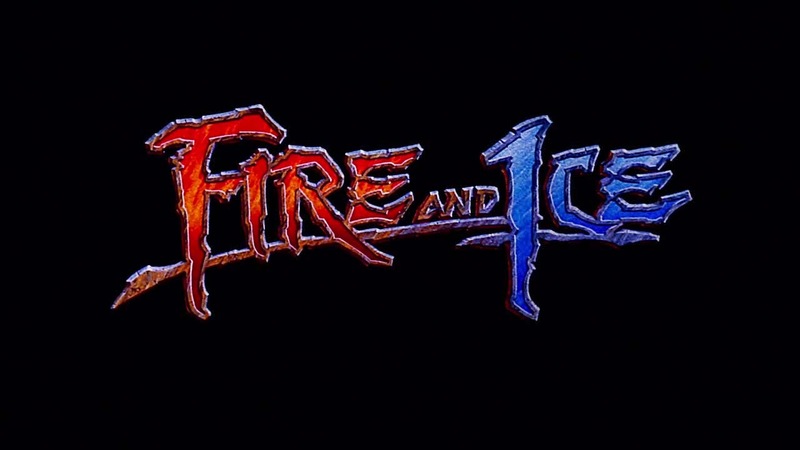 So is ‘Fire and Ice’ without merit? Not entirely, the battle scenes are very impressive and the film features a lot of nice artwork. If you want to watch this kind of film however you have a lot of other options to choose from, many which have more of a sense of fun about them.